Oh the weather inside is frightful...but what a frickin' cute puppy. Seriously, click and enlarge the image to see a handsome doggie. I'm a little squinty, but I had just taken off my glasses, as I wasn't in the mood to be photographed in them. I also wasn't in the mood to be feeling up Kris Kringle's thigh, but there I am....making my way toward the old man's twig and berries. In my defense, the photog told me to do it. Ask my cousin who was standing right there. Which by the way, irks the hell out of me. Not David. Never David. But we had our pics taken together and we were both supposed to get copies of them on our CD. Yes, they're using 1998 technology to provide the images. Don't get me started. I am hoping David got the copies of Ted, Petey, him and myself and he'll shoot them my way. But this organization doesn't seem to have it together, so I'm not hopeful. Still, you should see Ted, he's so cute. Still it was Petey's first visit with Santa - and my second (if you remember last year). Oddly enough, it looks like I'm wearing the same thing as last year, but it's a totally different sweater. Honest. ....and this year's Santa doesn't look as "real" as last years. That guy had it down! Anyway, I got six photos - this was the best of them. I got one with Petey yawning, he was fairly bored with the process, but he is majorly handsome in this pic and looking somewhat at the lens. The cam-ah-ra (say like Jenna Maroney) guy almost guy a pic of Petey kissing me, but he snapped too late and it didn't come out. That would have been the keeper. I can cross this off my bucket list. I don't think we'll need to do this again. 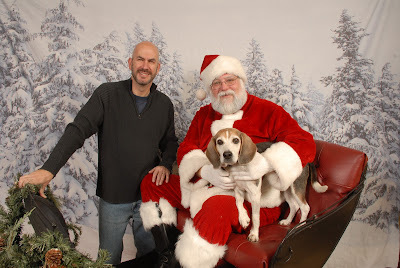 And for me, twice with Santa, in almost 50 years, is more than enough. Of course, I have the right to change my mind if I think Petey needs another picture, but I'll have to get his permission first. No red hat for you? So cuuute! BOTH of you. Love that smile. Very cute pic. My two would never go for it. At least in the pic, Santa looks very high quality. The really good ones (like hime) are in very high demand in the better malls and are paid very, very well. Maybe Santa is a polar bear during the off season and that's why he wanted your hand on his thigh? I think those twigs and berries are called mistletoe. I bet the photog and Santa had a little "deal" with the hand placement thingy. What a cute picture. I could never get Harper to go for it.